Watch it on YouTube, LINE Live, or Periscope. Sega will host the first ever Valkyria Chronicles 4 live gameplay broadcast on December 27 at 20:00 JST, the company announced. You will be able to watch it on YouTube, LINE Live, and Periscope. 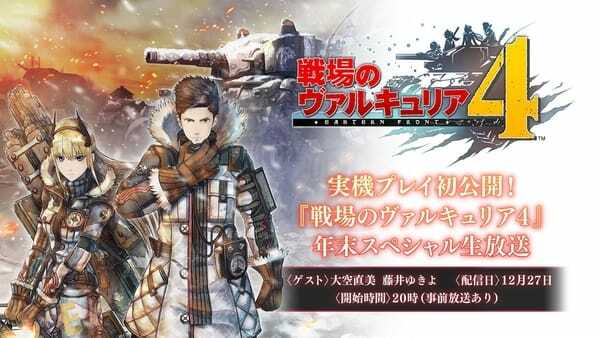 The broadcast will feature Valkyria Chronicles fan Hashiyan Kousaka as the MC, and special guests Naomi Ohzora (Nikola Graf voice actress) and Yukiyo Fujii (Chiara Rocino voice actress). If you missed it last week, read more about the game here. A few additional details also came out of this week’s Weekly Famitsu.